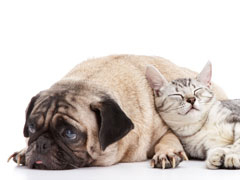 Veterinary dentistry and oral surgery is a relatively new and rapidly growing specialty. Dr. Kressin is committed to help in the development of this specialty. He teaches veterinarians and technicians at professional and non-professional meetings, via the internet (on the Veterinary Information Network, Vetdentalrad.com and others), as well as on various web pages using powerpoint and other visual media sources.